My love for 3D printed food strikes again. Thanks to 3D Systems’ new ChefJet and ChefJet Pro, confectionery 3D printers, it is now possible to print real, edible candy. 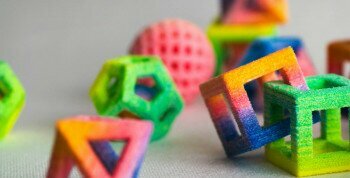 3D Systems, the company that manufactures ChefJet, claims that their candy-printing 3D printers are the first 3D food printers in the world, and it’s easy to see why these printers are so revolutionary. The shapes and designs that these printers are capable of producing are so intricate that they are said to resemble china glassware. According to 3D Systems, ChefJet Pro is even capable of printing wedding cake toppers, customizable with faces and outfits of your choice. Like any printing process, printing candy in color costs more than printing in black and white. With the original ChefJet, you had a choice of different flavors, and the option of printing in chocolate or sugar, but it was only capable of printing candy in black and white. But the ChefJet Pro takes things a step further, allowing larger creations to be built, and in full color. After all, candy is supposed to be bright and colorful – and ChefJet Pro offers just that. A ChefJet Pro 3D printer is capable of printing candy, cake toppers, delicate structures, and even customizable faces – all made out of edible candy, sugar, or chocolate, and in the flavor of your choice. ChefJet Pro is able to produce almost any 3D design, and takes the creation of new and exciting candies to a whole new level. 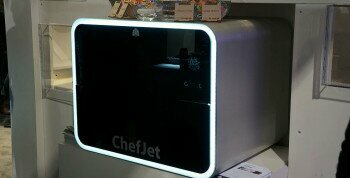 While not available for purchase yet, 3D printers ChefJet and ChefJet Pro are expected to go on sale sometime later this year. For now, however, 3D printed candy is available for purchase in California – just to hold you over until the next sugar rush.